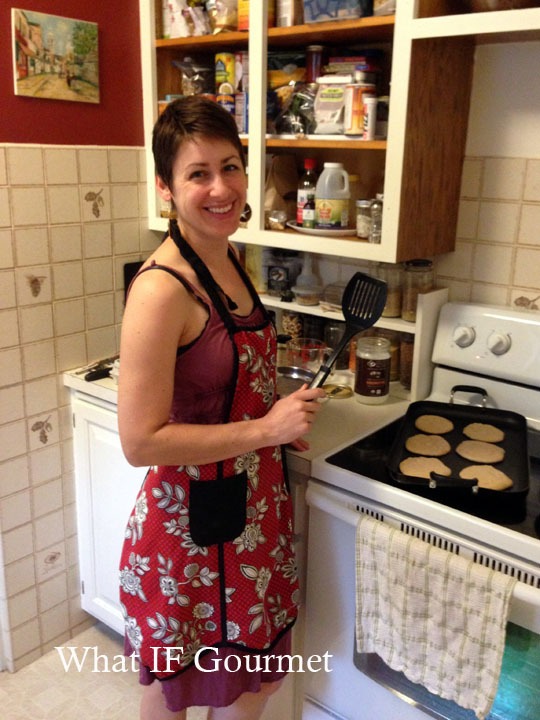 I am wearing the 1950s housewife-esque apron with a sense of humor… I am, after all, married to a feminist scholar! Soon after the Midwestern Gentleman and I moved into our current home, about two years ago, we made pancakes for breakfast one Sunday. We ate pancakes, sipped coffee, cuddled the critters, chatted, and enjoyed a lazy start to the day. It was such a nice morning that we decided to do it again the following Sunday… and the Sunday after that… and thus our dedicated Pancake Sunday tradition was born. Every week we try a new pancake and topping flavor combination, and we haven’t grown bored with the challenge yet. Last Sunday, we held our first Pancake Sunday Open House. The Gent brewed a giant percolator of coffee and heated a kettle of water for hot chocolate. 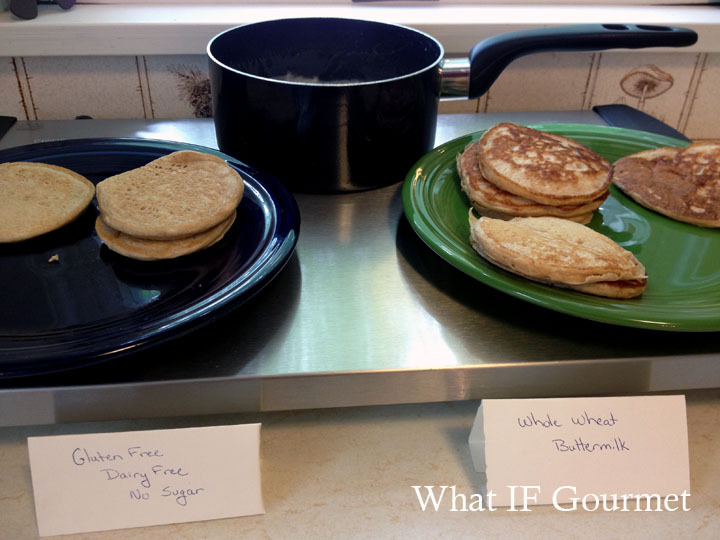 I manned the pancake griddle, with gluten-free/dairy-free/no-added-sugar pancakes on offer as well as whole wheat buttermilk pancakes (both generously spiked with vanilla and cinnamon). We invited friends and their families to drop by for a short stack, and asked them to bring a pancake topping of their choice. And they did! 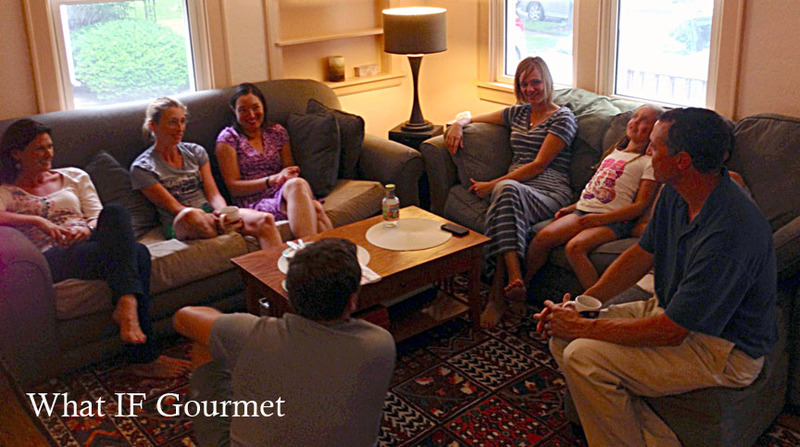 It was a stormy Sunday, so the house was abuzz with visitors filling their mugs, introducing themselves to one another, and chatting cozily while the rain poured down outside. 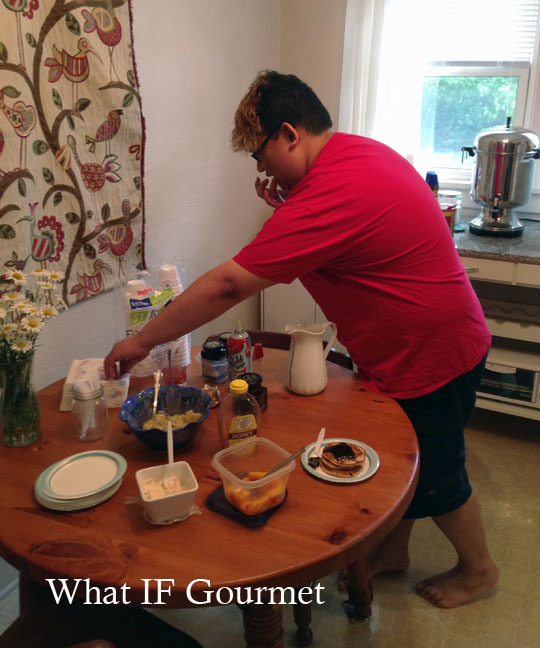 We chose from a buffet of flavored butter, berry jams, apple compote, fresh peaches, chocolate sauce, and coconut syrup to top our pancakes. When everyone’s belly was full of breakfast, we all settled down on the couches, chairs, and carpet of the living room for a hilarious group conversation that meandered from sharks to the hazards of superhero capes to whether toe socks were supremely comfortable or just plain weird. I was reminded just how lucky I am to live here with this community around me, all of these warm, funny, generous, genuine folks who like to eat pancakes. In a large bowl, whisk together the dry ingredients to break up any lumps. Add the wet ingredients and whisk to combine. Let sit for about 5 minutes, to let the coconut flour absorb the milk. Ladle onto a medium-hot griddle greased with coconut oil and cook for 2 – 3 minutes, until bubbles form and edges look dry. Flip and cook on the other side for an additional minute. Serve warm in good company. 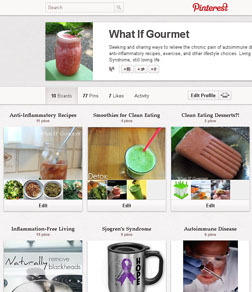 This entry was posted in Anti-Inflammatory Ingredients, Beverages, Breakfast, coconut oil (virgin/ unrefined), Dairy-free, fruit, Gluten-free, legumes, Recipes, spices, Vegetarian. Bookmark the permalink. Thanks for making time for us – would not have been the same without you! I am looking forward to trying these pancakes. What a great tradition! And you shared it. 🙂 Awesome. We will look forward to seeing you at the next one!